I previously had an old version of CC and I kept getting this error when I went to update. It never worked so uninstalled and attempted to re-install. I keep getting the same error when I try to install. Pictures posted below. Any help would be appreciated. 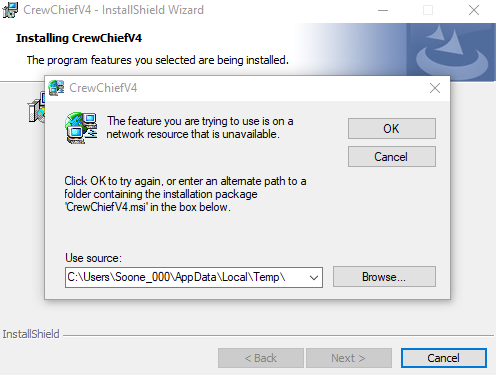 CC is the only app I have that ever has this problem, and it's so frustrating as it's nearly every update I have to manually download the installer and install it after it fails to auto update. Please can you just link to the latest installer and let us do it that way. I run TS, Trading Paints etc. which are updated regularly and it's only ever CC that has this problem. SO frustrating. Error is: "The system cannot open the device or file specified." Last edited by chriskeeble; 10-07-2018 at 11:45 AM. I use the msi installer packaging. It works for most people and I've offered some solutions to your specific problem. The installer is always downloadable directly from the link on this site. Previous versions are also downloadable. I'm not the only one facing this problem, there is nothing wrong with my box, as you put it. This is a well documented problem with MSI installers and the way they are deployed which can affect some Windows systems (even when properly configured). There is lots of software which is deployed in this way (including many well known software products such as Autocad) which cause the end users the same problem. My suggestion was for a possible work-around to save the repeated frustration for those of us affected by it - i.e. offer a direct link from the software / update screens to the download so it can be run safely without having to hunt for it. You may not be aware, but your website / forum / download link is not always as easily located for those of us not involved with it every day as it probably is for you. Sorry my suggestion / request appears to have hit a nerve. Just as .msi problems are documented online, so are the solutions to all of these problems, so please do your homework. I use CC for 2.5 years already, not a single install/re-install issue (unless I mess with files I shouldn't have). 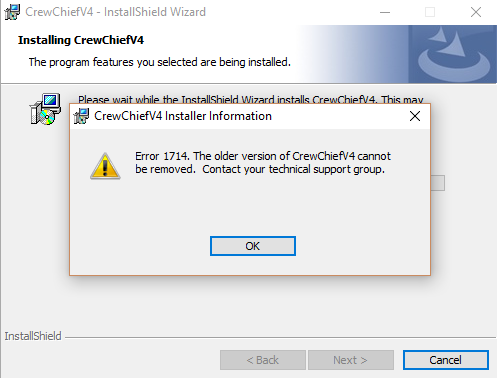 To recap, the issue I reported was an error when attempting to install the downloaded update having followed the prompts in the update available notification. The error was: "The system cannot open the device or file specified." Some people are very quick to be rude and defensive, rather than listen to what a user / customer has to say by way of feedback. @TheIronWolf - just because you haven't had the problem doesn't mean it doesn't exist. I've had the problem for many, many months, with various installs and a clean re-install of Windows 10, but I haven't told anyone it exists on every machine. And @Spartan - I'm sorry I didn't see the link you quite rightly pointed out. Having just received a notification for a new update again today, I've tried to download and update and had the same issue with automatically updating, so I thought I would try clicking the link you highlighted. Sadly nothing happens. But I'm sure you'll blame that on my box as well. I really like the software, so much so I donated. But the responses I've had to offering some feedback in the hope to tweak / fix things (not to criticise) were unnecessarily aggressive. Thanks all the same. Perhaps a little recap from my side might help too. @chriskeeble - I had problems of this kind with other software using MSI and with CC once. Most often, they were due to me messing with installer files, or sometimes due to registry issues during updates. Also, cleaners, tweakers etc can cause that. All such issues are discussed online, and problem is not CC specific. Also, search for MSIZap utility, it might help.